Louie D. Cacchioli was born in Borgo Val di Taro (or Borgotaro for short), a small town in Emilia, north central Italy. After immigrating to the United States with his family at age 10, Mr. Cacchioli struggled as an immigrant. Louie’s family settled in Queens, New York. After graduating from Long Island City High School Louie attended New York City Community Collage where he studied accounting. Louie graduated from the fire academy in April 1982. Then for the next two decades Cacchioli rode with Engine Company 47 and fought some of the worst fires in New York City history. On September 11, 2001, Engine-47 responded to the disaster at the World Trade Center. Mr. Cacchioli was part of a four company rescue-team that responded to the North Tower. Louie was separated from his fire company and single handedly saved the lives of some forty civilians by leading them down a stairwell and out of Tower 1. Due to the tragedy and injuries suffered from Ground Zero, Mr. Cacchioli lost many close friends, his health, and his career. In the aftermath of the tragedy, Cacchioli has rebuilt his shattered life. He has been active with physical therapy and involvement in a 9/11 survivors group. 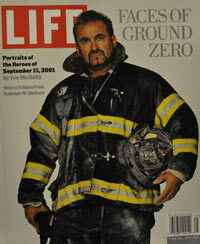 The photo-book Faces of Ground Zero: Portraits of the Heroes of September 11, 2001 followed next. It contains 150 McNally portraits; those from the exhibition as well as several that had previously never been shown before. Mr. Cacchioli’s photo is prominently featured on the front cover of both the hardcover and abridged soft-cover versions of that book. The American Spirit: Meeting the Challenge of September 11 was a 2002 follow-up book that featured new essays regarding the 9/11 tragedy. Mr. Cacchioli was featured in that book as well. On September 12, 2001, Louie was heading to the WTC site to dig for survivors after only three hours of sleep when he was approached by a reporter from People magazine. The reporter was interested in what Louie had experienced the day before. Conspiracy theorists then used that quote as proof that 9/11 was an “inside job.” Since then, Louie has repeatedly tried to set the record straight that he was misquoted. 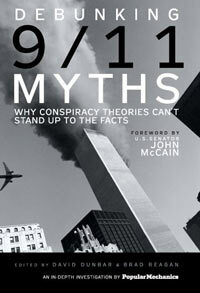 Louie even went so far as to cooperate with the editors of Popular Mechanics magazine and was interviewed for the book Debunking 9/11 Myths: Why Conspiracy Theories Can't Stand Up to the Facts (Hearst, 2006). Louie became an activist who has been heavily involved in a variety of causes including 9/11 remembrance, charities, and the World Police & Fire Games. He is also participating with 9/11 Families United Against Terrorism, a class action lawsuit against those who financed the Al-Qaeda terrorist organization. Louie has kept busy writing a book about his extraordinary life. His tome is not a 9/11 book, but rather a chronicle of his struggles. Cacchioli shares with the reader the unique stories about the glory, humor, anguish, insights, and personal opinions of his life.